In today’s busy global world where there are over 3 billion email users and 269 billion of emails are sent daily. No doubt emails and email blasts have become an entrenched part of life in every organization. There is literally a sea of emails, which makes it harder to keep track of all of them. Lots of the time is spent composing and tailoring each email. Enterprises are spending time trying to figure out “how many emails to send out each day?” and, also “what’s the best day to send an email?”. However, the interesting thing is that the open email rate for enterprises usually goes from 15-35% on average. And while those numbers are not bad at all, you can do a whole lot better! Why not use text messaging to reach out to your audience? Text messages had been around for years, but for some reason, this tool has been underrated, and instead of adding a whole lot of value it is only collecting a whole lot of dust among many nonprofits. If you check statistics on emails opened and texts opened you will soon conclude that there is no alternative to texting. The unresponded emails either bounce and don’t get to a recipient or they are put into secondary categories by email providers. Check out this insightful research. Which means they’re most likely not going to be read and will be lost in the clutter. Also, the number of unopened emails exceeds that of the SMS texts by far. So why then have we forgotten the simple truth, “you do not change horses in midstream.” If you want to connect to the people inside or outside of your organization, give mass texting a chance. With 97% open rate that cuts through the clutter. It’s an irreplaceable tool that you have to start with. Raise support and awareness – you want to get the word out and get people involved? With a mass text, you have the opportunity to reach out on a totally different level. It is a personal call to action with no group noise. You simply can’t get the same effect with an email. Coordinate volunteer and supporter groups – any nonprofits that are self-sustainable rely heavily on their volunteers or supporters. No matter the size of the group, they all need coordination. We do live in an age where everyone carries a smartphone. So when you have to coordinate in the real-time, you need something that will have that immediate effect. While you might have to wait hours or days to get an email response, everyone can pick up their phone and type out a quick text message to respond. This makes the coordination task so much easier and without frustrations. Inform of important events – whenever you need to inform people that a significant event is happening, it is key to notify every potential supporter or all those likely to participate. Think about it this way; if you post it on a social network, it’s like seeing a human billboard in your neighborhood. Sending an email would be like leaving a general announcement on the bulletin board of your community or apartment complex. But sending a personalized mass text is like a personal delivery with the recipient’s signature. In other words, nothing can cut through the noise like a text message with a personal touch. Send personalized thank you texts – to show your appreciation to the participants you could again be very general and send out an email blast all of those you want to thank. The success rate of that effort is still not the best and limited. Or, you can just write a thank you text that will be personalized for every contact you have with their name. It will have your number, and aside from showing your gratitude face to face, it will be the greatest way to say thank you in a very personal way. Affordable and effective technology – if you’re sending an email blast to big numbers of people, you’re probably still paying some company for a package deal or a certain volume of emails on a monthly basis. But using Reach you can send an SMS text, iMessage, email blast, Google voice or even WhatsApp text from your phone number to any other phone on multiple platforms. Is it more affordable? YES! Is it more effective? YES and YES! If your organization is a nonprofit, then we will even give you a 50% discount. Want to give it a try? Click here for an easy download and you be the judge. Raise more funds – How are you going to do that? Well think about it, the open rate of an SMS is 97%, it’s personal and has a call to action. With a response rate that high do you really need to spend hours on tweaking your message, optimizing and AB texting for maximal effect? Not really. Three percent of unresponded messages is something you can afford, and frankly, any enterprise would give an arm to have such a high response rate. What can motivate supporters better than this? Fast and easy – most times your work and office are on the go and your office space is with you in your pocket. When you only have your smartphone to communicate to your coworkers, organization members or volunteers, the fastest and easiest way to do that is by sending a mass text. It’s within reach. It doesn’t take long, and in such a short period, you have excellent results! Zero barriers to entry – an SMS app is built into every single phone. You don’t have to worry if a person has an email account or not. If they have a phone, they are within your reach. No additional software needed for the recipient. They don’t need to do anything. All you need to do is download the app, create a group and text away. And after sending a mass text to all the contacts, their response will automatically take you into a private conversation. Secure and robust tool – At Reach, we value integrity, transparency and your privacy above all. Most platforms collect cookies and data from their users and then sells that data to third parties that in turn use that information for marketing. Not on our turf. All contacts, data and personal information that you share stays encrypted on your device alone, and you are the only one who has access to it. We believe that using our app, the users are the ones who should have all the power and not the other way around. And in today’s world, it is highly stressful to find a simple, robust and secure app that gives you peace of mind regarding all your personal info. Take advantage of it. Personal and welcoming – All great things are very simple on an understanding level of an 8th grader, but with very sophisticated ideas. 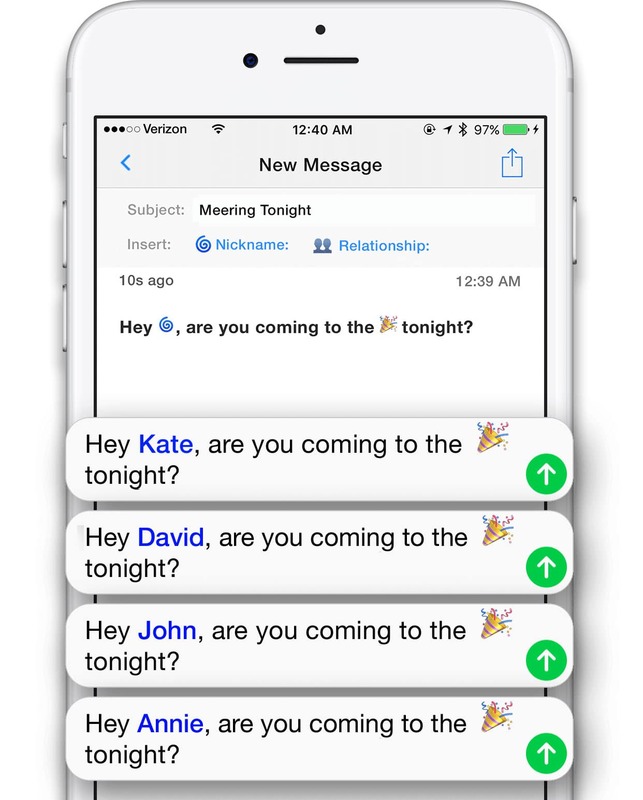 This mass texting app isn’t only simple to use and has no clutter. It will not leave you wondering what to do next. Super clear and easy to use, but that is not the only welcoming thing about it. While some hold an opinion that having a great design and, a colorfully creative interface will attract users. Despite that, the simplicity and fewer details are always what people will look for. There’s nothing more welcoming like plain text. No color or design can radiate the message as much as the content of the message itself. So keep it simple and personal. Great for people in lower-income countries around the world – needless to say, that a phone is more affordable than a PC or a laptop. And for nonprofits or social enterprises working in countries with the lower income, you have to be very focused on the channel you will use to communicate. Fortunately for everyone, sending a mass text message is the cheapest and best way to stay in touch, coordinate or inform. No matter if you are in the country or do it from abroad. A vital part of the marketing strategy for any nonprofit – last but not least, when doing a marketing campaign keep in mind that you can still raise more money if you use an SMS donation program. You can present the goal and why it is important what you do. And chances are, people will immediately connect with your message and share your enthusiasm for whatever social change you’re trying to achieve. But as quickly as they’ve connected with your vision, they can forget just as quickly. What is the most effective way to remind your supporters? The answer is simple, mass text! Your Reach can exceed your grasp. Download our easy app for free and send your first mass text today.